FREE SHIPPING when you order from our Bookstore! Looking For Straight Answers To Today's Food-Related Questions? 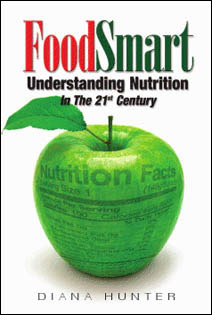 In FoodSmart: Understanding Nutrition in the 21st Century, award-winning author Diana Hunter provides a unique overview on how to easily make sense of conflicting nutrition information and make educated dietary choices. Both enlightening and user-friendly, FoodSmart covers a wide variety of nutrition-related topics including dieting, organics, sweeteners, supplements, food irradiation, genetically modified (GMO) foods, and food safety, along with essential information on food marketing to children and life-cycle nutrition from pre-birth through adulthood. In addition, FoodSmart provides pros and cons for many commonly consumed foods along with useful listings of food and drug interactions, regulatory contacts, and safe food storage durations. It is written in an easy-to-read, highly unconventional format with same-page footnotes and web references for further information. FoodSmart: Understanding Nutrition in the 21st Century is an informative, easy-to-read guide designed to help you make sense of conflicting nutritional information and make educated dietary choices. Both enlightening and entertaining, it covers a wide variety of nutrition-related topics. FoodSmart WINS the 2010 National Indie Excellence Award in Nutrition! Follow FoodSmart on FaceBook including tour updates and nutrition discussions. © 2012 FoodSmart.org. All rights reserved. Site Design and Maintenance by Southern WebWorks, Inc.